*Gardening: Growing Organic Food in Your Backyard by George Markson. Price: Free. Genre: Outdoor & Recreational Areas, Organic, Vegetables, Cookbooks, Food & Wine. Rated: 4.8 stars on 12 Reviews. 43 pages. ASIN: B01FSN3HTE. Hydroponics: 62 Beginners Lessons on How to Make Your Own Hydroponic Garden! (hydroponic gardening, hydroponics for beginners, how to build a hydroponic garden) by Ronald Lee. Price: Free. Genre: Topiary, House Plants, Crafts, Hobbies & Home. Rated: 4.6 stars on 7 Reviews. 93 pages. ASIN: B01G2OMLC2. Posted on June 12, 2016 Author KibetCategories Free Kindle Gardening Books, Gardening Deals, HydroponicsLeave a comment on Kindle Gardening Deals for Sunday! Just what I needed for my garden! *Personality Tests For Your Soil: The Real Dirt on Cultivating Crops, Compost, and a Healthier Home (The Ultimate Guide to Soil Book 1) (Deal, Not Free) by Anna Hess. Cost: $0.99. Genre: Organic Gardening Deal, Sponsor, Soil, Sustainable Agriculture. Rated: 4.6 stars on 7 Reviews. 69 pages. ASIN: B0182KLXPK. Reviewers like it: Do your garden a favor and read this book! Enjoying a productive garden starts with the health of the soil. It is a very useful reference guide, which is exactly the kind of eBook I love! It really shines as a practical handbook! It has real life gardening examples to help visualize the process of supporting a healthy plant life! Gardening: A Beginner’s Guide to Simple Gardening, Easy Steps To Develop A Green Thumb and Grow Your Own Vegetables (Gardening, Gardening Tools, Gardening for beginners, Growing Vegetables) by Ronald Raymond. Price: Free. Genre: Crafts & Hobbies, Vegetables, Crafts, Hobbies & Home. Rated: 4.2 stars on 5 Reviews. 24 pages. ASIN: B01DFJLBEG. Posted on April 11, 2016 Author KibetCategories Free Kindle Gardening Books, Gardening Books, Gardening Deals, HorticultureLeave a comment on Kindle Gardening Deals for Monday! 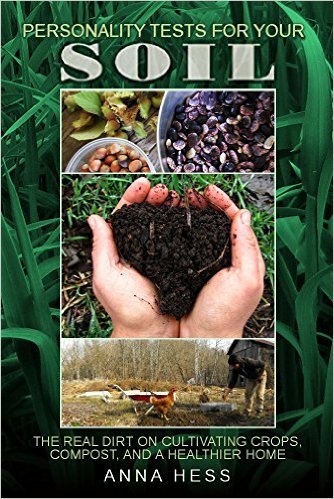 *Personality Tests For Your Soil: The Real Dirt on Cultivating Crops, Compost, and a Healthier Home (The Ultimate Guide to Soil Book 1) (Deal, Not Free) by Anna Hess. Price: $0.99. Genre: Organic Gardening Deal of the Day, Sponsor, Soil, Sustainable Agriculture. Rated: 4.6 stars on 7 Reviews. 69 pages. ASIN: B0182KLXPK. Reviewers like it: Do your garden a favor and read this book! Enjoying a productive garden starts with the health of the soil. It is a very useful reference guide, which is exactly the kind of eBook I love! It really shines as a practical handbook! It has real life gardening examples to help visualize the process of supporting a healthy plant life! *Hydroponics: Hydroponics Gardening For Beginners – A Simple User Guide To Grow Hydroponics Herbs And Vegetables At Home (Hydroponics, Hydroponics Gardening) by Sherry Forrest. Price: Free. Genre: Gardening & Landscape Design, Decorating, Crafts, Hobbies & Home, Gardening & Horticulture. Rated: 4.8 stars on 14 Reviews. 78 pages. ASIN: B01DKBZWYY. Posted on April 10, 2016 Author KibetCategories Free Kindle Gardening Books, Gardening Books, Gardening Deals, Horticulture, HydroponicsLeave a comment on Kindle Gardening Deals for Sunday!